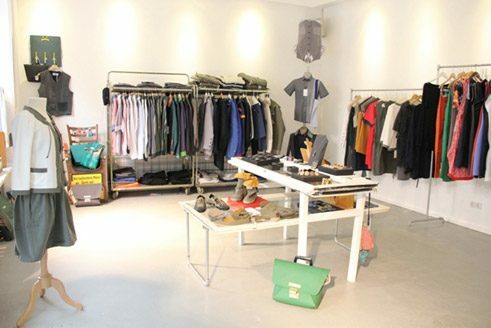 Stepping away from the conventional fashion industry the Upcycling Fashion Store in Berlin offers a pioneering platform for designers and labels in Germany. The shop façade is decorated with old garments. There is a mosaic doormat on the entrance step, made from carpet colour samples. Designer items hang from an ingenious rail configuration. Carina Bischof is decorating an antique window – now used as a table top – with earrings made from zippers and notebooks that hold pages from old books, postcards and photos. aluc | Photo and © David Nassim Carina Bischof, co-founder of the Upcycling Fashion Store, has discovered a real alternative: “We rely on new creative ideas, unusual and unused materials and an attractive design”, she explains. She is also wearing a top made from an old shirt that provides a simple and straightforward answer to the curious questions of some customers: “So what is this upcycling all about? She then sits down on a bench that has been made from old pallets. aluc | Photo and © David Nassim “Recycling? I call it down-cycling. They simply smash up bricks, they smash everything. What we need is upcycling, where old products are given more value, not less,” complained British engineer Von der Burgdorfer in a magazine article in 1994. It was the first time that the term upcycling gained real meaning. 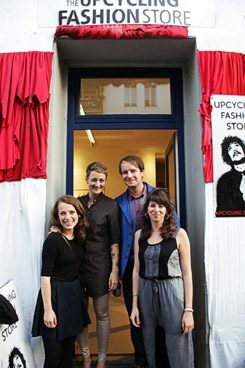 Arianna Nicoletti, Carina Bischof, Luise Barsch and Jonathan Leupert have put a face to the term upcycling in Germany. 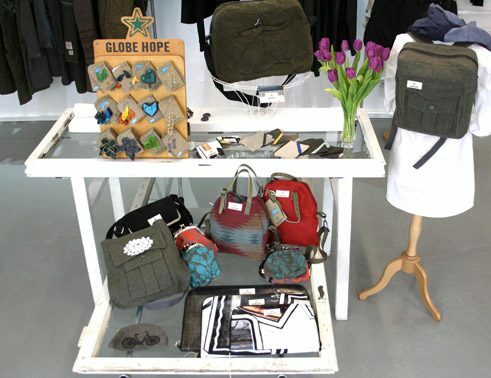 They set up the Upcycling Fashion Store together and launched the fashion lable aluc. Their shop concept clearly contrasts the everyday sins of the fashion industry: cotton monocultures, underpaid sewing machine operators and a waste of resources – to name just a few. 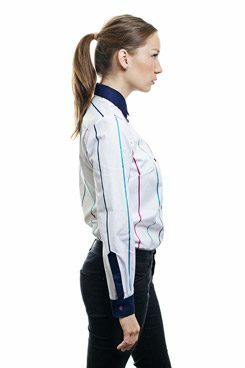 Upcycling Fashion Store | Photo and © Luise Barsch The aluc label presents shirts, blouses and accessories that are made out of unused left-over and sample materials from a textile mill that works for fashion houses such as Hugo Boss. “Friends of ours have set up a production workshop for upcycling in Bulgaria and this is where a part of our collection is made”, Carina explains. For other collection items she has cooperation agreements with sheltered workshops in Berlin and Central Germany. Each and every detail reflects the concept of a sustainable development. The buttons, for example, are from a social project in which disused buttons are sorted by people with autistic behaviour. aluc | Photo and © Marc Huth “We are not able to fully meet the “zero-waste cut” principle, but I do like to describe our method as one with “minimal-waste cut”, Carina adds with a grin. 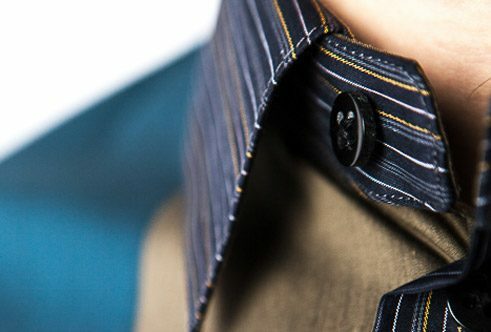 “We use left-over material to make bags, purses and mobile phone pouches.” Removable collars round off the design and different styles give each shirt its own individual expression and at the same time prevent premature wear. “The aim is not just to reduce textile waste, but rather to put waste to good use”, says Carina. From the beginning to the end of a garment’s life cycle, a lot of different waste is created. How do the designers find such novel ideas? 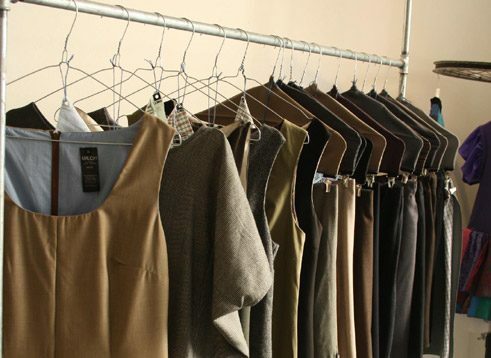 Carina is absolutely certain about this: “All of these different materials inspire the fashion designers to take unique and individual approaches.” Many designers use “pre-consumer waste”, waste products that occur during the manufacturing of a garment. The label FromSomewhere, for instance, uses faulty products, offcuts and colour samples that were formerly considered worthless. These are then further processed and turned into luxury designer items. Transforming old into new – this is the principle and practice of the childrenswear recycling lable Kamaeleon, where “post-consumer waste” forms the basis of the label’s approach. Kamaeleon creates children’s fashion from used textiles, these are toys to wear and are also free from chemicals due to the number of times the material has been washed. It is the beginning of a new cycle. 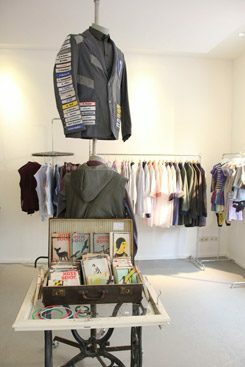 Upcycling Fashion Store | Photo and © (detail): Luise Barsch Upcycling Fashion Store | Photo and © Marina Chahboune The doors at the Upcycling Fashion Store are now open. Carina quickly clears away the last two crates of bottles left over from the “Strich und Faden” meetup the night before. This is where fashion designers and people generally interested in the movement regularly meet to draw inspiration and support. In cooperation with the Berliner Stadtmission (city mission) Arianna has established a link that gives designers easy access to old textiles. Their new concept in fashion manufacturing met with a very positive response at Fashion Weeks in Berlin and in Paris. “It is our aim to raise awareness about the catastrophic conditions in the fashion industry and to also present alternative methods”, Carina explains, as she moves to welcome the first customer. Every new visitor to the shop can spread the concept of upcycling to further circles. Marie-Luis Dulig is a student of Culture and Media Education, she lives in Berlin.